Hanoi (VNA) – The domestic agricultural sector is working to raise the quality and value of Vietnamese coffee given that coffee export turnover has yet to match the volume. Vietnam ships more than 1.5 million tonnes of coffee abroad each year, of which 90 percent is raw coffee which yields low value. Vietnamese coffee is exported to more than 80 countries and territories worldwide, with export revenue exceeding 3 billion USD, making up 14 percent of the market share and 10.4 percent of raw coffee export value globally, second after Brazil. Vietnam’s top coffee importers are Germany, the US, Italy, Spain, Japan, Belgium, Russia, Algeria, the Philippines and China, which, together, account for 80 percent of the country’s total coffee export turnover. However, during 2013-2017, the local coffee sector grew by only 6.57 percent annually mainly due to fluctuations on the global coffee market and the unbalanced domestic coffee export structure. 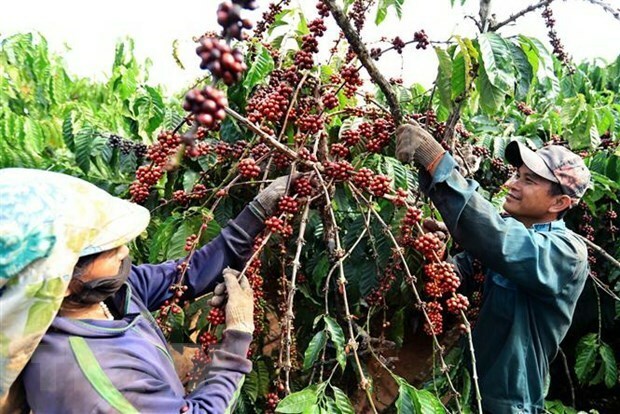 Nguyen Quoc Toan, acting head of the Ministry of Agriculture and Rural Development (MARD)’s agricultural product processing and market development department, said most Vietnamese exporters have yet to set up direct connections with foreign coffee roasting and grinding firms. He also noted the low administrative capacity of local processing, business and export enterprises, and weak foreign language and international commercial skills of Vietnamese coffee sales staff. Besides, poor trade infrastructure, the lack of transaction and auction floors, unprofessional information and market price analysis services and other factors have also hindered the sector’s growth, he said. Vietnam has 150 coffee export firms, including 13 foreign direct investment (FDI) enterprises, along with more than 3,000 dealers purchasing coffee. However, only a third of them have raw processing factories for export, and up to 90 percent of domestic businesses and all FDI enterprises buy raw coffee through traders. To improve added value for Vietnamese coffee, the MARD is implementing a project on developing high-quality coffee. The project aims to assist at least 10 businesses in completing wet coffee processing, improving coffee quality and reducing post-harvest losses, and about five to 10 others in building high-quality coffee production models. Under the project, at least 10 firms will invest in production and deep processing of high-quality coffee products, thus ensuring added value for the coffee sector. Toan underlined the need for the coffee sector to restructure, improve production chain value and maintain coffee area at about 600,000 ha and annual export volume of about 1.5-1.8 million tonnes. The sector will step up investment in infrastructure for production, especially harvesting, transporting, drying and preserving steps to ease post-harvest losses; and encourage investment in coffee planting, processing and consumption in the chain connectivity to form modern businesses. It also prioritises coffee roasting and grinding plants using cutting-edge technologies, each with annual capacity of at least 5,000 tonnes and instant coffee processing mills with average capacity of no less than 500 tonnes per year. MARD Deputy Minister Tran Thanh Nam said the sector should select major groups and businesses with adequate capacity in terms of capital, science-technology and market to lead the value chain. He also suggested maintaining traditional export markets while accessing promising ones, with special attention paid to China, the EU and those joining the Comprehensive and Progressive Agreement for Trans-Pacific Partnership (CPTPP) and the ASEAN Economic Community (AEC).